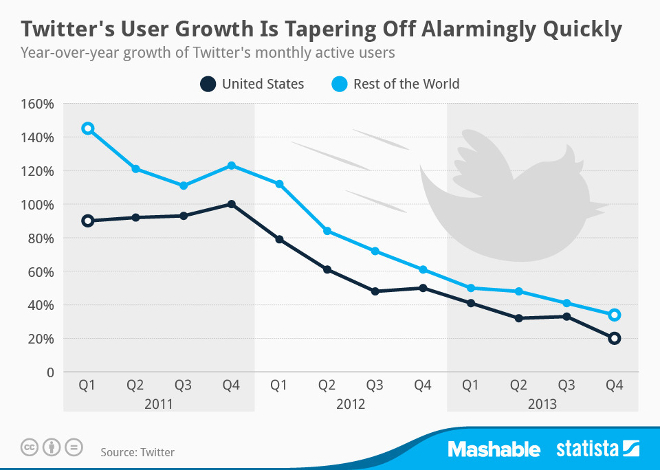 This is happening at a pretty quick pace, which means Twitter may have achieved peak growth a while back. The best growth it’s seen over the past three years was 140%, yet for the fourth quarter of 2013 that’s down to 40%. Make no mistake, the company with the blue bird logo is still growing, but it may have already matured. As any service adds more and more users, at one point the growth will naturally start to slow down. That’s happened here even if Twitter has just 241 million monthly active accounts, compared to Facebook’s more than 1 billion. Of course, its numbers are still nothing to sneeze at, but it looks more and more like Twitter will never be able to compete with Facebook on user numbers. Twitter’s growth is likely to decrease even more in the coming years, which means it will have to work harder and harder to get new people hooked.